So no, I admit it's not quite on the level of hot, freshly-delivered pizza, it's still tasty and you don't feel overly full or bloated or disgusting after eating it (which is always a major plus in my book)! You can easily keep this paleo, gluten free, grain free, dairy free or even nightshade free (use pesto instead of tomato sauce and pick specific toppings). Give it a shot - I bet you can find a combo of toppings that makes you forget you're eating a head of cauliflower under all that deliciousness! Preheat oven to 400F and line a baking sheet with parchment paper or nonstick foil. 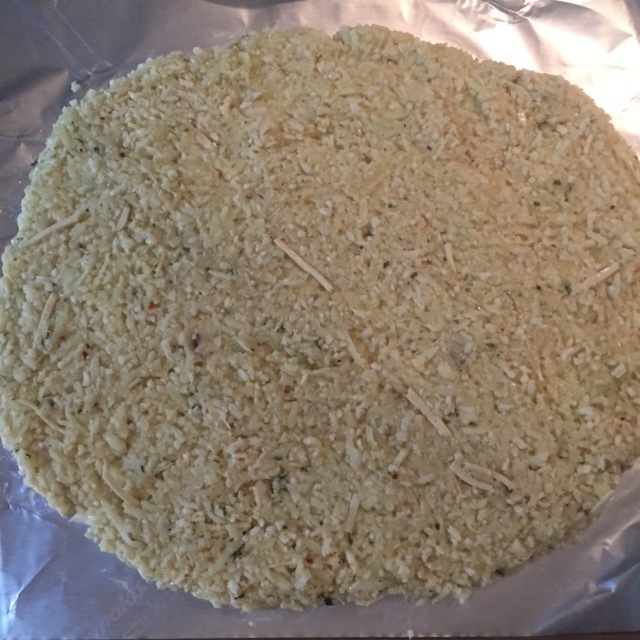 If you have a whole cauliflower head, start by ricing your cauliflower either in a food processor (using the grater attachment) or with a box grater. Place riced cauliflower into a large bowl and microwave for a few minutes to lightly steam it. Then use a cheesecloth or tea towel to ring out as much moisture as possible from the cauliflower. The more moisture you can get out, the crispier your crust will be in the end. Lightly beat 2 eggs and add the eggs, spices (oregano, garlic powder, salt, pepper, crushed red pepper) and mozzarella, if you're choosing to use cheese, to your cauliflower and mix it all together. Pour your cauliflower mixture onto your lined baking sheet and pat it into a pizza shape (or a heart or an animal - whatever you'd like!). Bake for 20 minutes until it just starts getting lightly browned around the edges. While your crust is baking, chop up any toppings you might want. 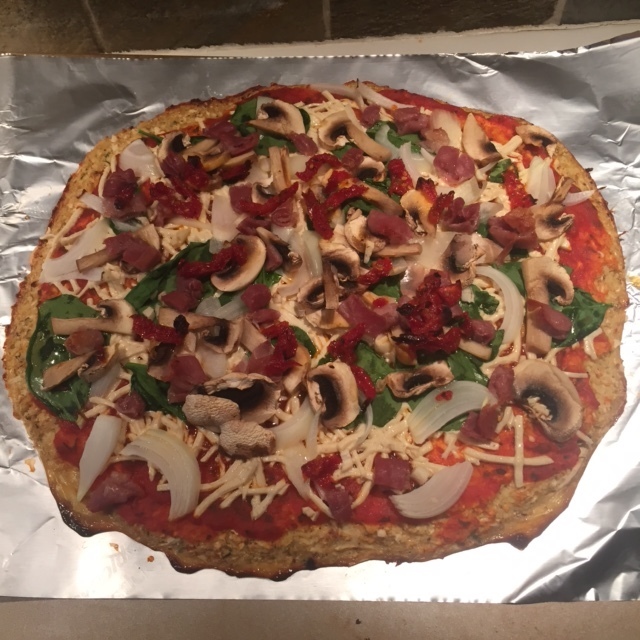 I used tomato sauce, onion, garlic, mushrooms, sundried tomatoes, daiya vegan mozzarella, spinach and prosciutto and it was super yummy, but use anything you're in the mood for! Once your crust has baked for around 20 minutes, remove from the oven and add all of your toppings. Bake for another 10 minutes or so (or until everything is as crispy as you like it to be) - then remove, cool for a few minutes, slice and eat!